'Hemstitched' (Ben Hager, R. 1989). Seedling# RE4889. TB, 32" (81 cm), Early midseason bloom and rebloom (August, September and October in inland California). 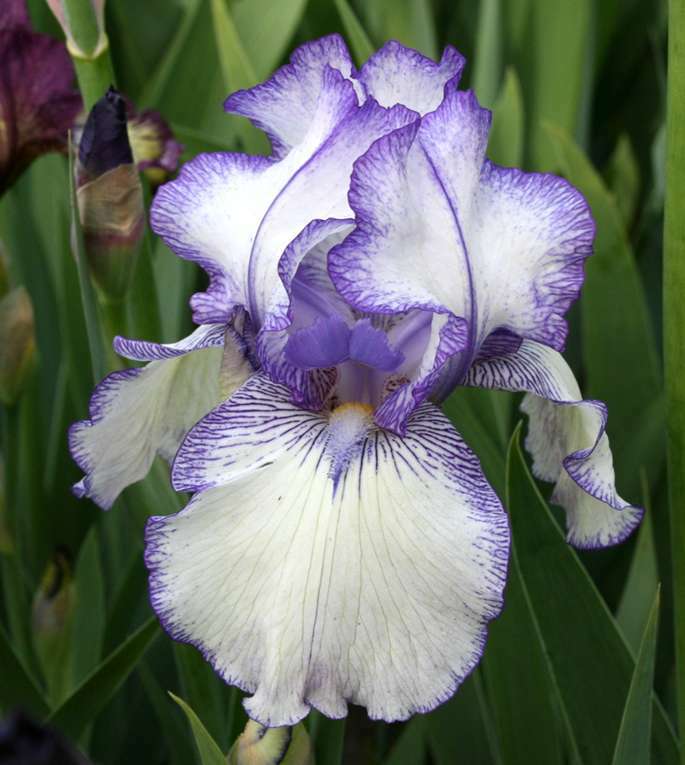 White, narrow edge stitched lavender violet, heavily veined hafts; pale blue white beard. Seedling# T3711Pc: ('Space Odyssey' x 'Socialite') X 'Earl Of Essex'. Melrose Gardens 1990. From AIS Bulletin #277 April 1990 Introducing HEMSTITCHED (Hager) Lavender blue 'hemstitched' edges-all petals. Nice form. Sister to Autumn Circus. Spring and August to frost. $35.00. Melrose Gardens. JPG HemstitchedSI.JPG manage 216 K 16 Apr 2019 - 15:47 Main.TLaurin Photo by Sandy Ives.